Young adult novelist and official member of io9's 2012 power list, Leigh Bardugo, has been asked "What's the new hot YA fiction trend?" quite a bit. And her response is pretty priceless. 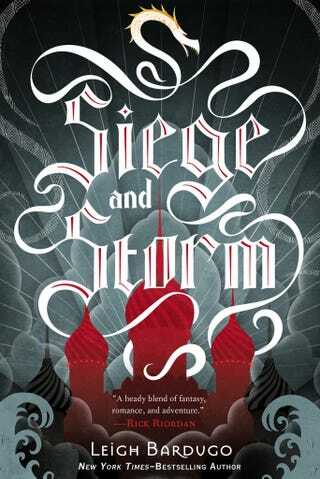 Thanks to Bardugo, we've got an exclusive look at the official cover to the second book in the Grisha Trilogy, Siege & Storm. Behold the beauty and get used to hearing this name, since Bardugo's debut novel Shadow and Bone has been optioned by Harry Potter producer David Heyman and Up in the Air producer Jeffrey Clifford, for Dreamworks. Whatever the future holds for YA, I hope that people will stop wigging out about it. The anxiety over what YA means to the culture overall is understandable, but it also skews to panic and pearl-clutching way too fast. All heroines do not have to be exemplars. All love interests do not have to be gentle and true. Young readers are capable of making their own judgments about a character's actions, and despite our best efforts, YA authors have not yet managed to set the youth of America on the devil road. Also, the (increasingly numerous) adult readers of YA? We're doing okay. We aren't languishing in a prolonged adolescence or in need of having our reading choices curated lest we become the victims of sparkly stalkers. So, in the glorious future, whether we're calling a book young adult or new adult or just science fiction or fantasy, I hope we'll see less panic, less bashing of readerships, and more open engagement with the work. Also, unitards. Siege and Storm will hit shelves on June 4th, 2013.